Pioneering AI specialist Massive Analytic Limited, has won a competition run by the Ministry of Defence's Defence and Security Accelerator (DASA) section to investigate the application of its patented leading edge AI technology, Artificial Precognition. The aim is develop a system which will stop hostile forces from hacking into communications being relayed to soldiers and hence obtaining vital operational details which could give them an advantage in the battlefield. Founder and CEO George Frangou told Express.co.uk: “On one level the modern theatre of war will be like ones of the past. People will die as armed forces take and hold ground. "On another, the next major conflagration between advanced powers will be like nothing seen in history. The deployment of robotics and AI can, and will, change the course of history. "Victory on tomorrow’s battlefield will depend on huge computing power, smart algorithms and the brutally efficient application of the two to a narrow domain. Mr Frangou added: "The AI that we’re developing for DASA is focused on helping to win the invisible battlespace, for example being able to counter hostile efforts to interrupt, falsify and listen in on communications using the EM spectrum (radio). This is part of cyber warfare. 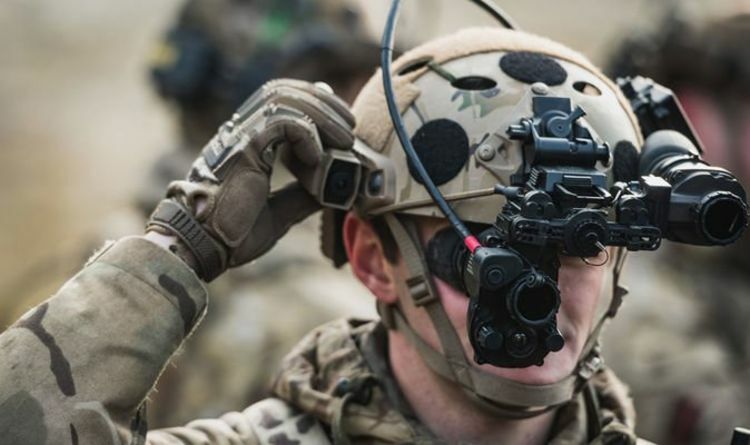 "Where this fits into the future and connected soldiers is providing safe channels/networks for wearable technology to aid soldiers in combat. "For example it would be a disaster for our armed forces if their “smart” technology was hackable." Mr Frangou said the aim was to begin trialling new equipment within two years, explaining: "We’re in the midst of a boom in AI technologies, the race is on so to speak. "AI is being deployed across every sector, including defence in at least some fashion. "What we’re developing is still in phase one, we’ll be delivering a demo of our capabilities in June which will then extend into trials hoping in the next 18 months." Addressing ethical concerns about using AI and robotics to wage future wars, Mr Frangou said: "We’re a long way off having a “self-aware” AI – if that’s even possible in the sci-fi sense. "What we are seeing are specialised AI’s that are designed to perform specific roles or jobs – they’re essentially very good at what they were designed for but don’t really have the capacity to grow beyond just doing their job better than before. "I think with any new technology there are ethical concerns about how it’s used, our belief is that AI is something that will transform the world in a positive way but there is of course potential for AI to be misused. "The AI we’re developing for DASA is however a counter measure rather than something than can be used offensively." Mr Frangou said the technology could likewise be applicable to any technology which uses the electromagnetic spectrum. He explained: "For example there would be an opportunity domestically with the police to use this technology to aid in say counter terrorism by identifying radio patterns or even specific communications. "Or for improving EM communications generally by optimising bandwidth for say mobile phones."